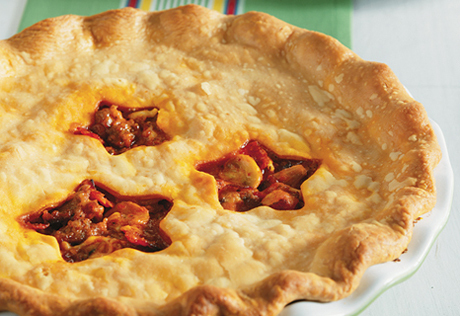 The kids are going to love this...favorite pizza toppings like sausage, pepperoni, sauce and cheese are mixed together and topped with pie crust to make a mouthwatering casserole. What fun! Heat the oil in a 10-inch skillet over medium-high heat. Add the sausage and cook until it's well browned, stirring often to separate meat. Pour off any fat. Add the mushrooms and onion and cook until they're tender. Stir the pizza sauce and pepperoni in the skillet and cook until the mixture is hot and bubbling. Remove the skillet from the heat and let cool slightly. Stir in the mozzarella and Parmesan cheeses. Spoon the mixture into a 2-quart casserole. Place the crust over the sausage mixture and crimp or flute the edges. Cut several slits in the crust. Bake for 30 minutes or until the crust is golden brown. Let the casserole stand for 10 minutes before serving. Cut the casserole into 6 slices.